Plastic breaks easy. A Cake Stackers™ tiered aluminum cake stand will hold up even under the toughest conditions. Know how to stack a wedding cake level, straight, easy, and safe? Try Cake Stackers! 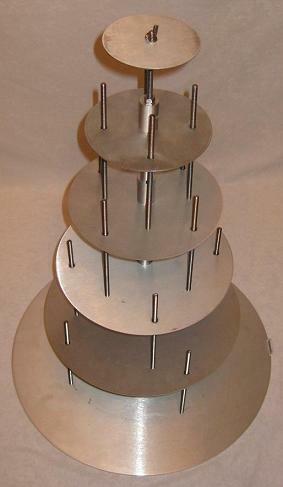 Our patented food grade aluminum wedding cake stand will hold tall, heavy cakes - even fruit cakes! Plastic cake stands must be assembled at the wedding reception, where using the Cake Stackers™ all aluminum cake stacking system, finished wedding cakes can be delivered fully assembled,decorated, and safely carried without the worry of the cake sagging, falling, tilting, drooping, or shifting. Customize each cake with several designs to match the desires of your client; all with one wedding cake stand. The aluminum and stainless steel cake stand will adjust to accommodate a tiered, round, square, tall, offset, staggered, cascading, or traditional stacked wedding cake design. This means you don’t have to have a dozen different stands for your business, just one. You can even use it as a cupcake stand with a small cake as a topper! Build your cake tiers from 3.5 inches to 6 inches or double or triple them for heights of up to 18 inches per tier. Each 3.5 to 6 inch cake tier is individually supported and carried safely by the Cake Stackers™ tiered cake stand stacking system. Focus your guests’ attention on a beautifully decorated cake and not the wedding cake stand. What makes Cake Stackers™ wedding cake stands unique is that they actually disappear inside the wedding cakeand give the appearance of several cakes stacked perfectly straight on top of each other. The most nerve-racking part of wedding cakes is the delivery and set up. Cakes just don’t travel well. Road bumps, turns, sudden stops, and crazy drivers are the gauntlet on the delivery; but once you arrive at the venue it gets even worse! Then you have stairs, doors, steps, turns, elevators, people, and a maze of tables to avoid. All the while having to keep the wedding cake level and hope it doesn’t fall. With Cake Stackers™ you never will worry again about your stacked wedding cake making the delivery perfectly straight. Turn it sideways and it won’t fall off! Never again cut another dowel or stack cakes at the wedding venue. Stack a 6 tier wedding cake in less than 5 minutes and deliver it stacked safely! If you can turn your tiered cake sideways or even upside down, you certainly can take a few bumps during delivery without worry. Support your cakes, try the Cake Stackers™ aluminum cake stand and decide for yourself! Questions? Ask us about our food safe aluminum cake stand here. 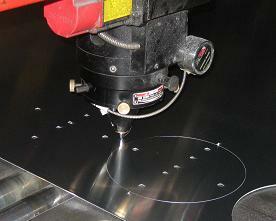 Watch the laser machine cut our cake stands perfect...and fast!